Polish utility Polska Grupa Energetyczna (PGE) is concentrating on its own nuclear plans instead of taking part in the Visaginas nuclear power plant in Lithuania or buying power from the forthcoming Kaliningrad nuclear power plant in Russia. The Polish group's decision not to proceed with its involvement with the Lithuanian plant was based on the analysis of information presented by Visaginas Atomic Energy (Visagino Atominė Elektrine, VAE), the company said. "Taking into consideration the current conditions, which at this stage have appeared to be unacceptable for PGE, and also the PGE Group's other key projects, we have decided to suspend our participation in the project before assuming any formal obligations," said PGE management board president Tomasz Zadroga. The company also said it was not at present conducting any business talks with Russian company Inter RAO concerning the possibility of purchasing electricity from Kaliningrad. The announcement would appear to further underline the level of PGE's commitment to building its own nuclear power plant in Poland. In the past, two Soviet-era RBMK reactors operated at Ignalina in Lithuania, providing 70% of the country's power, but those reactors were forced to shut down in 2004 and 2009 as a condition of Lithuania's accession to the European Union. In February 2007, the three Baltic states of Lithuania, Latvia and Estonia, together with Poland, agreed to build a new nuclear plant, Visaginas, next to the Ignalina site. Development company VAE was established the following year by companies from the four countries including PGE. In July, Hitachi-GE was selected as a strategic investor in the project based around plans for a single Advanced Boiling Water Reactor (ABWR), to begin operation from about 2020. Most recently US utility Exelon was contracted to support the development of contracts for fuel supply as well as for engineering, procurement and constrution. At the same time, Russia has pressed ahead with plans to build the 2400 MWe Baltic nuclear power plant in Kaliningrad, close to the Lithuanian border with an eye to exporting power to the Baltic states, Poland and Germany, although this would depend on large-scale transmission infrastructure upgrades. Meanwhile, plans to build a nuclear power plant in Poland have been gathering pace. 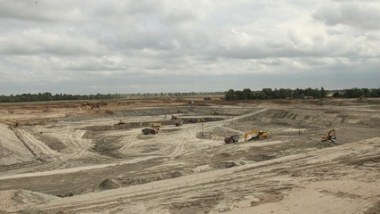 A new nuclear power program was approved by the Polish government in January 2011, with plans for the first plant to be in operation around 2020. PGE has shortlisted three potential sites, and a commercial contract is expected to be signed for the first 300 MWe plant by the end of 2013.